This is a great edible playdough recipe and it can be eaten immediately. It’s basically the same playdough recipe as the edible playdough recipe. 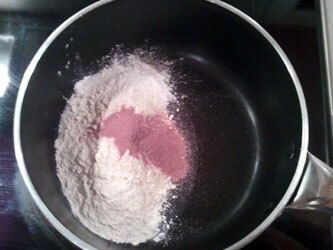 Mix dry ingredients in a large/medium pan. 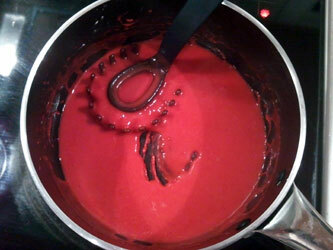 Stir over medium heat until it looks as playdough. The end result should have the color of your chosen kool aid. The whole process takes about 8 minutes. This recipe and several of our other recipes can be found on other websites as well, but we had it first though. I suppose that proves its quality, so try it out! This is one of my favorite playdough recipes. The color, scent and taste you get from the Kool Aid is just amazing. Before we begin we have to collect the ingredients. We have some Kool Aid, cream of tartar, flour, sugar, water and oil. The oil is already added to the water. Add the dry ingredients to a pan. 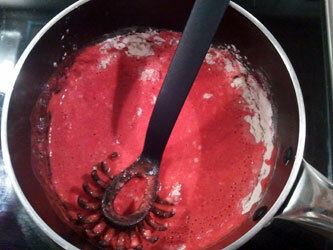 The Kool Aid doesn’t look like it will give much color at this stage, but just wait. 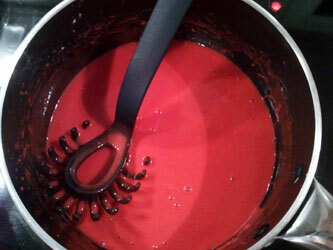 Add the water/oil mix to the pan and stir, the Kool Aid will explode with color. Keep stiring until all lumps are gone. When it’s all stired well together it should look something like this. Now start cooking on medium heat, while slowly stiring. When heated for a while it will start to get thicker, just like the image below. At this point you can expect 1-2 minutes until it’s done. When done it should look like this. You can try to cook some more of the water out of it, just be careful so you don’t burn it. My playdough was a bit sticky, but it was simple and quick to fix, just knead with some flour and it will improve quickly. 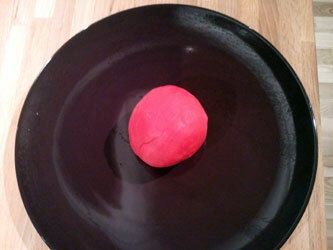 The finished playdough looked like this, very nice color and the scent is amazing. It actually tastes ok too, but not in very large portions I suspect. Good luck! Worked well! We had to add a little extra flour at the end to counteract some tackiness but after that it was a really good dough and smelled great. We used grape and lemon-lime. Well, the sugar makes it taste alot better. How long do you leave it in the microwave? Awesome! easy and quick. My 3 yr old helped. We put it in the freezer for a few miutes for quicker play! It was a b it tacky at first, we sprinkled some flour on the table and kneaded it in. With cook time cool time(with help from freezer) and prekneading……….it took all but 10 mins. Have you ever tried doubling or tripling the recipes? Or do you recommend making one batch at a time? I need to make some for a pre-K class. Thank you. I’m sorry, I haven’t, but it should work though. I’m guessing you would have to be a bit careful with the water, use a bit less when doubling/tripling. I have doubled the recipe many times with success. Always remember with Pre-ks to throw the dough away after a week because its full of germs. THIS DID NOT WORK AT ALL! Just a big mess I now have to clean up. Well…then you did something wrong. 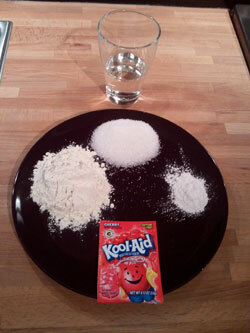 How do you make the kool aid play dough in the microwave? I want to make it with my preschool class and we don’t have a stove. I actuaslly haven’t tried it in the microwave, but the basic idea should be the same. Mix the ingredients and then give it a spin in the micro. 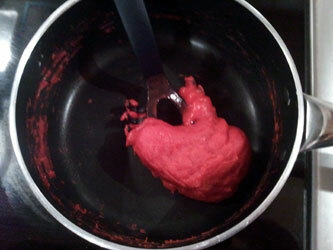 I made the kool-aid playdough with my daughter and we used cherry kool-aid! I didn’t allow her to eat it or anything but we had a lot of fun making it! Definitely had to put it in the freezer to cool off and we did roll it in flour so that we could play with it easier! But we had a blast and it worked great for us! im finding im needing to add alot of extra flour at the end did i do something wrong?? 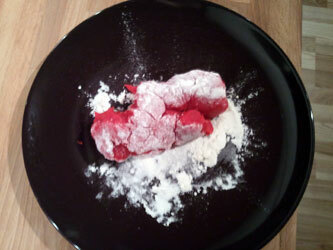 Try with a bit less water, or if you don’t intend to taste the playdough, try switching the sugar with salt. Just made this for my son and it was great! I like the sugar instead of salt, I don't think he is going to eat any but if he does at least it is not a salt lick…lol thanks! Is there any reason that you could not use generic drink mix? I made this tonight, and it turned out wonderfully. It take take a lot longer than the recipe says for the play dough to thicken up, and I still had to knead a lot more flour into it. But, it still turned out awesome! Can’t wait for the kids to play with this! This worked out great. I was out of regular sugar so I substituted powdered sugar. I did not need to add more flour and it was not sticky. I love it! It’s not grainy at all like some of the others. Hi, for us in the UK, what is Kool-Aid? Didn’t have any Kool-aid so I used a scoop of Tang and salt instead of sugar so far it looks great.